In recent years, many companies have switched from metal to plastic containers. Plastic inherently allows a container to breathe and can cause products to develop a skin on the surface of the liquid. To prevent this, solutions are placed on top of the liquid to prevent air from reacting with the fluid and causing skinning. Top off systems are used to spray a small amount of water, glycol, or other anti-skimming agent onto the surface of pre-filled liquid. Our top off systems allow precise placement of solution to be accurately dispensed inside the container after it has already been filled with liquid. Evaluating and identifying solutions to these and other problems, is part of what we do best here at ABA. Those principles are part of why we are the renowned and respected in the filling machines and equipment industry. It is also why so many companies choose ABA as their go-to supplier. 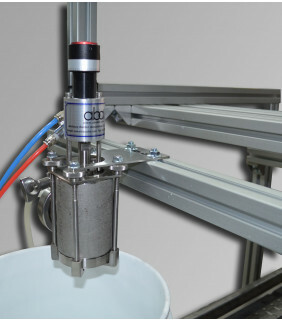 The ABA-TOPOFF is available with interchangeable spray nozzles and can be supplied with either pneumatic or electronic controls. 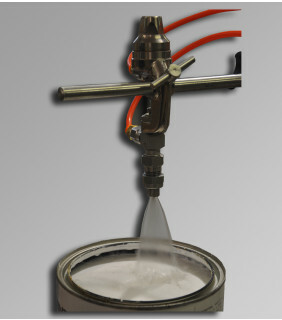 ABA-TOPOFF-COV-100 is a cone style fill head which means that the anti-skimming agent is more gently released and will not forcefully break the surface of the liquid. Please contact ABA today to discuss which top-off system would best suit your needs.